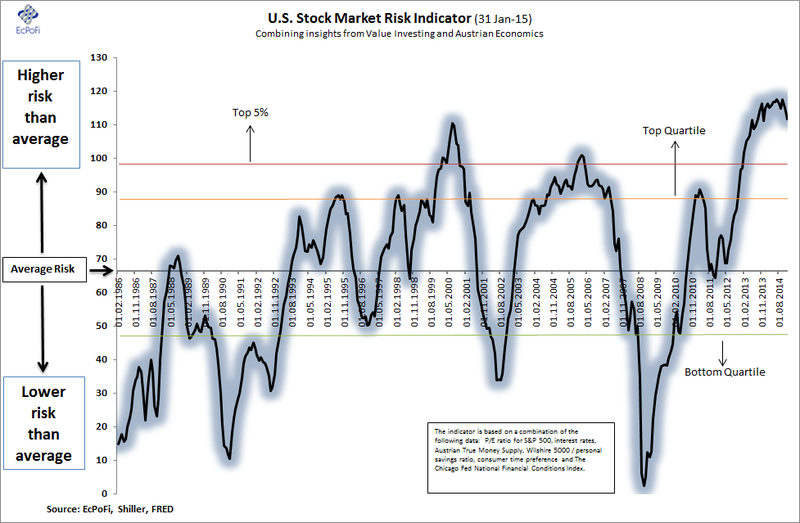 The U.S. Stock Market Risk Indicator, which combines insights from the schools of value investing and Austrian economics, fell in January. The current reading still remains among the highest ever recorded based on data going back to 1986. The higher the reading, the poorer the outlook for future stock market returns. The indicator therefore continues to signal future stock market returns that will be poor at best. If history is any guide, the indicator flashes red and predicts a significant stock market correction in the not too distant future. A decline in the value investing component was the primary cause for the January decline in the indicator. Based on the developments in recent months, it appears the indicator has peaked, at least for now. When reading the chart, remember that risk increases proportionately with upward movements in the indicator, but that the risk is only finally revealed when the indicator declines.